St. Louis Blues: Can Patrick Maroon Save His Season? Can Patrick Maroon Save His Season? 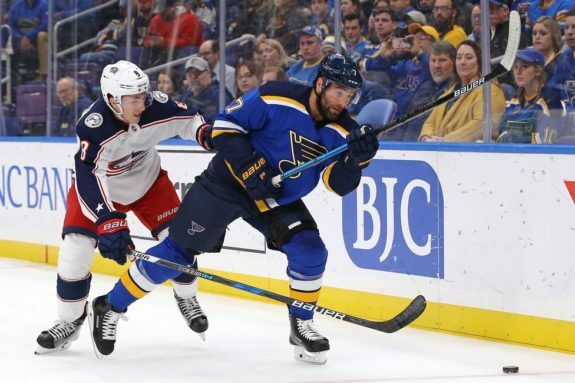 The St. Louis Blues thought they were putting the finishing touches on an incredible offseason when they signed Patrick Maroon to an incredibly friendly one year, $1.75 million contract on July 10. They were not only signing the gritty, powerful winger they needed, but they were bringing on a hometown kid in the process. But the seasons of both Maroon and the Blues have mirrored each other, in that both have been unexpected nightmares. The Blues are 12-15-4, and Maroon’s play has been one of the most disappointing aspects of the team so far. Is this the entire story of Patrick Maroon’s tenure with the Blues? Or is another chapter yet to be written: one where Maroon returns to the great player he once was and makes some great, hometown memories? Maroon’s season could not conceivably be off to much worse of a start. He has just eight points in 25 games, which puts him on pace for 27 on a full season. His shooting percentage is 2.9, far and away a career low. He is last on the Blues with a plus-minus of minus-15. That adds up to a point share of -0.1, meaning that Maroon is actually hurting his team more than helping so far. There are other worrisome trends as well. Maroon’s Corsi-For Percentage (CF%) is 47.0, down over five percent from his career mark. He’s not possessing the puck well at all, though the whole team is ninth-worst in the league in that category. He has just one even-strength point all season, an assist, and he’s only taken 34 shots. And to top it all off, none of those points have come in his last nine games. It couldn’t be much worse for the man affectionately known as “the Big Rig.” And the team around him isn’t performing any better. Trying to put words to a 7-2 defeat on Sunday afternoon, Maroon spoke bluntly, saying: “I don’t have answers anymore. 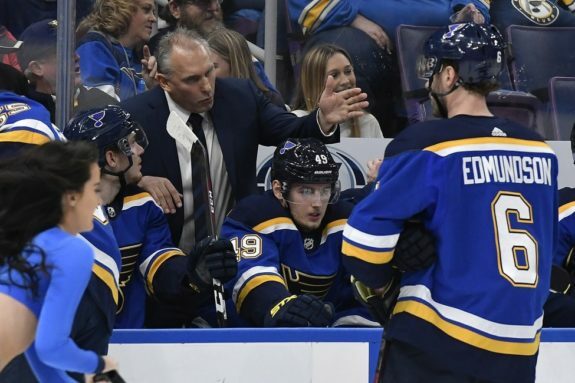 It’s just kind of embarrassing, to be honest with you.” Whether he was speaking about the team or his own play, Blues fans are feeling the same confusion. And yet, there may be hope for Maroon to turn it around. Though it hasn’t taken immediate effect, the switch from Mike Yeo to Craig Berube behind the bench could benefit Maroon terrifically. Berube is an all-time NHL tough guy, and he has plenty to teach Maroon, whose grit and physicality could be a key cog in turning the Blues’ season around. And it isn’t as if there’s no reason for hope with Maroon. While his own CF% is down, his relative CF% is at 0.2, meaning that the team maintains slightly better possession of the puck with Maroon on the ice than without. It’s a marginal advantage, and his career mark has been 2.4 in that category, so there is still room for improvement. But it’s a sign that perhaps it’s the team dragging down Maroon, and not the other way around. The Blues’ power play, which was red hot at the start of the season, seemingly fell off around the time that Maroon missed a stretch of games with an injury. Though they haven’t really regained their initial form, his size has been a huge advantage on special teams, and he is an ideal screen for inconsistent but dangerous sniper Vladimir Tarasenko. If both players heat up, the power play could be clicking in no time. There is plenty of evidence that Maroon’s problems are as much or more ill luck and a lack of confidence than they are his inability to perform. A shooting percentage of 2.8 has to come up eventually, and with it, his confidence may rise. If he breaks his nine-game scoring drought and builds a little momentum, the Big Rig could be trucking again in no time. The Blues are a mess, and as nearly as anyone can tell, the locker room is in disarray. Maroon may be new to the group, but he’s not new to St. Louis, and he may be exactly the player-leader the Blues need. Perhaps it is Maroon who can rise above the chaos, make his voice heard, and instill in his teammates what it means to be a Blue. There can be little doubt that the 2018-19 Blues’ fate and Patrick Maroon’s fate are intertwined. They need him to begin to perform, and he needs his teammates to help build his confidence. Blues fans would like nothing more than to see Maroon begin to live out his childhood dreams by becoming a hero while wearing the Blue Note.